In the Agency version of Beaver Builder, you can suppress the display of the built-in Beaver Builder layout templates (on the Templates tab in the Content panel) and instead display a set of your own saved layout templates as the core templates. Your templates can be categorized into groups, as shown in the following screenshot. When the categories are opened, the templates are displayed in a grid format with thumbnail images. If you have a multisite installation, you can specify which installation has the "master" saved layout templates to be displayed. Note: Replacing the core templates with your own means that your clients will no longer be able to save layout templates. 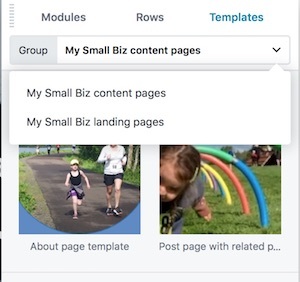 This functionality was created with the assumption that you want clients to choose only from the templates you provide, not use prebuilt templates or save their own. The following procedure assumes that you have already saved your custom layout templates, assigned them to categories, and set featured images for them. See the article on categorizing and adding thumbnails to saved templates. On the WordPress admin panel, go to Settings > Beaver Builder (or prior to Version 2.1, Settings > Page Builder) and click the Templates tab. In the Enable templates section, select Enable core templates only. When you override the core templates, your saved templates become both core and user templates, so you want to disable user templates so they're not displayed twice in the list. The choices to show saved row, column, and module categories are handled in a different article. For a multisite installation, enter the ID of the site whose saved templates you want to take precedence in overriding the core templates.